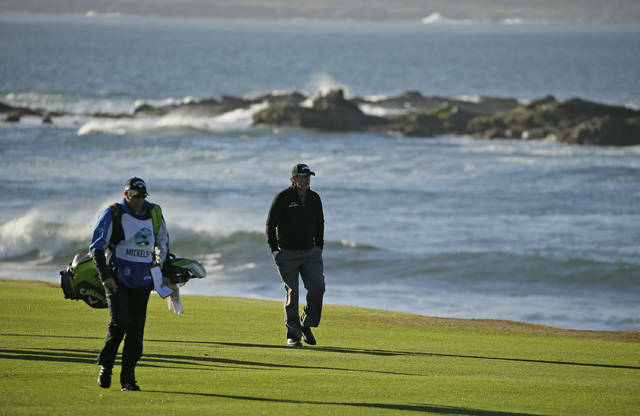 LOS ANGELES (AP) — Golf Channel is interested in live programming from Monday to Wednesday, and the answer might be found in college tournaments. It is adding another prestigious event this year, and more could be on the way. Golf Channel already has the East Lake Cup in the fall, along with the NCAA men’s and women’s championships in May, which has made for compelling television with eight finalists competing in team match play. The Western Intercollegiate is next. The 54-hole stroke play event is entering its 73rd year and is held at storied Pasatiempo, an Alister MacKenzie design in Santa Cruz, California. It will be televised live from April 15-17, the Monday through Wednesday right after the Masters. Getting televised live will only add to the prestige of what already is one of the premier college events in the spring. The trick is figuring out what else would fit. It helps to have courses with heritage, such as East Lake and Pasatiempo, and Knapp said there needs to be a balance between fall and spring. Golf Channel already has elevated interest in college golf through the NCAAs, and more live events could be a plus. Knapp said he hoped to have a full college slate of events over the next four years, conceding that not every tournament (or course) works for TV. Even so, it can be hard for the average fan to keep track of a college season, such as who is playing where. “We’re trying to help with that to a degree that we can come up with a televised series that makes sense,” he said. What would a Presidents Cup be without Fred Couples involved? Go back to 2007 to find the last time Couples was not part of the matches. U.S. captain Tiger Woods appointed the 59-year-old Couples to be an assistant at Royal Melbourne in December. Couples remains one of the most popular figures in golf with players and fans. He was Presidents Cup captain in 2009, 2011 and 2013, and an assistant the last two times. Woods also selected Steve Stricker and Zach Johnson, and he plans to announce one more before the Presidents Cup on Dec. 12-15. Stricker was Presidents Cup captain in 2017 and is expected to be appointed Ryder Cup captain for next year. Phil Mickelson, Tiger Woods and Billy Casper — all native Californians — now share an obscure record for most PGA Tour victories in California at 14. Woods won his tournaments on four courses — eight at Torrey Pines, three at La Costa Resort, two at Pebble Beach and one at Harding Park. Nine of his 14 were regular PGA Tour events. He won U.S. Opens at Torrey and Pebble, two World Golf Championships at La Costa (Match Play) and one at Harding Park. Mickelson won multiple times on all the West Coast venues, except for the Safeway Open at Silverado, which has been around for only five years. Along with his five titles at the AT&T Pebble Beach Pro-Am, Lefty has won three times at Torrey Pines and twice each at the old Bob Hope Classic, Riviera and the winners-only Mercedes Championship when it was at La Costa. Casper was the real king of California. He won the U.S. Open at Olympic Club in 1966. He won twice at Pebble and the Hope, and twice in the Los Angeles area on different courses, neither of them Riviera. He also won seven other PGA Tour events, some of which no longer exist, such as the Bakersfield Open and Hesperia Open. In all, Casper won his 14 titles in California on 12 courses. That doesn’t include the three-course rotation at the Hope. The Mexican caddie for Matt Kuchar when he won the Mayakoba Classic told golf.com he was paid $5,000 the night after the victory, and that Kuchar later offered an additional $15,000 that the caddie turned down because he found it unacceptable. “No thank you. They can keep their money,” David Girl Ortiz told the website. Kuchar used Ortiz for Mayakoba when his regular caddie couldn’t make it. Kuchar earned $1,296,000 for the victory. Michael Bamberger at golf.com spoke to Ortiz through a translator. The caddie says the original agreement was $3,000, plus an unspecific percentage of whatever Kuchar won. Ortiz says he didn’t expect to be paid like a regular PGA Tour caddie — a typical payout is 10 percent for a victory — but that he thought it was worth $50,000. Alex Baldwin has been appointed president of the Web.com Tour, becoming the first woman to lead one of the six tours sanctioned by the PGA Tour. She replaces Dan Glod, president the last two years of the PGA Tour’s main development tour, who is taking a role in sponsorship strategy. Baldwin most recently was vice president of marketing partnerships for the tour. Before joining the tour in 2017, Baldwin worked at Fenway Sports Management and CAA Sports. She also was an agent at IMG, where her clients included Hall of Famer Karrie Webb and Brad Faxon. James Hahn and Kevin Kisner have been elected co-chairmen of the Player Advisory Council for 2019. That means they join the PGA Tour Policy Board next year for three-year terms. Hahn and Kisner were elected over Paul Casey and Justin Thomas. An international player has never served on the PGA Tour board. … Hall of Fame pitcher John Smoltz, who won the celebrity portion of the Diamond Resorts Tournament of Champions, is getting sponsor exemptions to three PGA Tour Champions events — the Cologuard Classic in Arizona (March 1-3), the Mitsubishi Electric Classic outside Atlanta (April 19-21) and the American Family Insurance Championship in Wisconsin (June 21-23). … The Web.com Tour added the Robert Trent Jones Golf Trail Championship in Alabama to its schedule, to be played April 18-21. With his victory at Pebble Beach, Phil Mickelson joined Tiger Woods as the only players to surpass $90 million in career PGA Tour earnings. Woods, now with more than $115 million, went over the $90 million mark 10 years ago. “The behavior is not acceptable. But what’s going on? What’s led to that behavior? That’s the question.” — Paul Casey, on Sergio Garcia damaging five greens out of frustration at the Saudi International. “They’re very unique,” so much so that fanciers strive to make sure people realize the unusual feet aren’t a deformity, Rousseau said. To the Rousseaus, it’s worth traveling from Franktown, Colorado, to New York just to get attention for lundehunds at Westminster, where Eva had a memorable turn in last year’s televised semifinals. She stopped to scratch her ear and back while parading around the ring, drawing laughs from the audience. On Monday, Eva’s only competitor, Pikku, won the breed and took its spot on TV. Owner Carrie Riley of Rockwall, Texas, said she’d like to see more people take an interest in lundehunds. Some dogs had the breed ring all to themselves at this week’s show, including a Boykin spaniel named Nana, a harrier named Cora and an English foxhound named Whiskey. The English foxhound and harrier are among the 10 rarest breeds in the AKC rankings, but Boykins aren’t all that uncommon, and they’re the state dog of South Carolina. But the small, water-loving hunting dogs were for years something of a South Carolina secret, and they’re still not as widely known as some other spaniel breeds. The sole sloughi that was entered didn’t show up. The athletic, greyhound-style dogs became eligible for Westminster just two years ago. “They’re becoming more and more rare,” said Clegg, whose 17-year-old daughter, Caroline, showed their kuvasz Mo’Ne. The stunning, snowy-white Hungarian livestock guardian has a protective, independent nature that requires an experienced owner, said Clegg, of Lebanon, Ohio. The harrier, meanwhile, is trainable and a great family pet if provided enough exercise, said Cora’s co-breeder, Donna Smiley. Overall, the more than 2,800 dogs that signed up to compete for Best in Show this year come from 203 breeds and varieties. That’s every AKC-registered breed except the Chinook, a sled-puller that’s the official state dog of New Hampshire. Dogs such as French bulldogs and golden retrievers — the show’s biggest entry, with as many as 57 competing Tuesday — have to best a crowd just to get past the breed ring. There were nine keen hound faces in the Cirneco dell’Etna ring, though the rabbit-hunting breed is the seventh-rarest in the U.S. and debuted at Westminster only in 2016. AUSTIN, Texas (AP) — After their early years racing each other in karts, Marcus Ericsson and Felix Rosenqvist took very different paths chasing checkered flags around the globe before finally landing in the United States. MANCHESTER, England (AP) — When the reality check came for Ole Gunnar Solskjaer at Manchester United, it wasn’t even handed out by a full-strength Paris Saint-Germain. A 2-0 victory in the Champions League — consigning Solskjaer to the first loss 12 games under his caretaker command — was produced by PSG on Tuesday without two of the French club’s fearsome forwards. Neymar was already ruled out with a broken foot when Edinson Cavani hurt his left thigh at the weekend to join the world’s most expensive player on PSG’s injury list. “They were a level above us,” Solskjaer said after the first leg of the last-16 contest which saw United’s record-signing Paul Pogba sent off. Old Trafford instead became a stage for Kylian Mbappe to shine in tandem with Angel Di Maria, who relished the revenge mission on his return to his former club. By the time Di Maria responded to the torrent of abuse by picking up a bottle of beer hurled at him and taking a sip, PSG was already leading thanks to academy graduate Presnel Kimpembe’s first PSG goal in the 53rd minute. Di Maria, who struggled in his only season at United before being offloaded to PSG in 2015, sent in the corner that Kimpembe raced into the penalty area unchecked to meet with a volley. The second goal, on the hour, was the culmination of an electric counterattack. As Di Maria sent in a cross, Mbappe darted between center backs Eric Bailly and Victor Lindelof and clipped the ball under goalkeeper David de Gea for his 23rd goal of the season. Without two of its usual front three, the French league leaders commanded the midfield instead, with Marco Verratti often the orchestrator. United was forced to adapt, too, after losing Jesse Lingard and Anthony Martial to injury for the second half. Substitute Alexis Sanchez struggled to impose himself up front. Solskjaer is capable of transforming the fortunes of players — just look at Pogba. “I know Paul wants to just shield the ball so he’s unlucky that he hits (Alves) on the knee,” Solskjaer said. Not only was it a first loss for Solskjaer since replacing Jose Mourinho, but the heaviest-ever home defeat for United in Europe, having previously only been beaten by one-goal margins. In the night’s other last-16 game, teenager Nicolo Zaniolo scored twice to lead Roma to a 2-1 victory. United’s lackluster performance was a continuation of the European form under Mourinho in the group stage. United has only scored one goal at home in four Champions League games this season, a 1-0 victory over Young Boys. Aside from victories in north London against Arsenal and Tottenham, facing PSG was United’s biggest test since beating Italian champion Juventus at Turin in November in the group stage. “You can see we haven’t played games at this level for a while,” Solskjaer said. Twenty years after winning the Champions League as a United player, this was Solskjaer’s first taste of the competition in management having only previously coached Molde in his native Norway and Cardiff before being hired by United. Solskjaer was still Cardiff manager when United last won a knockout phase game in the Champions League — against Olympiakos under David Moyes in March 2014. A repeat of that 3-0 win in Paris next month would take United through to the quarterfinals. ARE, Sweden (AP) — Aksel Lund Svindal stretched out his arms and looked to the snow-filled sky, soaking in a big skiing atmosphere one last time as thousands of flag-waving Norwegians cheered their idol at the finish area. Didn’t matter that he’d been beaten to gold — by 0.02 seconds, no less — by teammate Kjetil Jansrud in the final race of his illustrious, medal-filled, 17-year career. Svindal, who is retiring at age 36 following persistent knee injuries, was beaming as he shared the top step of the podium with Jansrud — his close friend and training partner for two decades — after the downhill at the world championships on Saturday. Vincent Kriechmayr, the bronze medalist from Austria, was happy to leave the stage, clearly feeling like an imposter on a day which turned out pretty much perfect for the legions of Norwegians who crossed the Swedish border to see Svindal’s last race. Crown Prince Haakon and Crown Princess Mette-Marit were among them. The bromance continued in the medal ceremony hours later, Jansrud proffering Svindal forward to take the acclaim of spectators in the plaza in the middle of Are. In many ways, this was a shared victory. After the start was delayed because of fog and heavy snowfall, Jansrud — racing with two broken bones in his hand after a fall in training 2 1/2 weeks ago — went out at No. 6 and set a fierce pace on a shortened course, taking 0.65 seconds off the time of Matthias Mayer. Svindal, the two-time Olympic champion and five-time world champion, came down three racers later and admitted to being nervous. He was 0.08 seconds ahead at the first checkpoint, 0.02 behind at the second, and then 0.10 adrift as he came round the final few bends of his skiing career. He soared down the hill and over the line, to almost deafening roars. “Aksel you are my hero,” read one sign held aloft in the grandstand. Svindal playfully pointed at Jansrud, who was sitting in the leader’s throne, after acknowledging the crowd. They both knew they’d posted times that would be hard to beat, and that proved to be the case. While Svindal just missed out on a chance to become the first man to win the downhill world title three times, he still joined Kjetil Andre Aamodt and Marc Girardelli as the only skiers to collect a medal at six world championships. Already an Olympic champion in super-G at the 2014 Sochi Olympics, this is Jansrud’s first world title, adding to his two silvers at worlds. A big Liverpool soccer fan, he compared the feeling of skiing into the atmospheric finish area at Are to how he envisaged it would be like scoring a goal at Anfield. Following his fall in training in Kitzbuehel, Austria, Jansrud was told by doctors to sit out for six weeks. He couldn’t pass up the chance of racing at a worlds so close to home, though. Beat Feuz of Switzerland, the previous downhill champion, finished fourth and Mayer, the former Olympic downhill champion from Austria, came fifth. They were mere footnotes on an afternoon that was as much about Svindal as the guy who won gold. “They were so close, but this silver is like gold for us,” said Anders Holm, a 39-year-old from Trondheim, Norway, who was at the race with his wife and two children. Svindal bowed to the roaring crowd during the flower ceremony and again when collecting his medal. “This is more than I expected, to be honest,” Svindal said. “I knew I was fast enough to win or take a medal, but to make it happen on the one day it counts is something else. AP Sports Writer Andrew Dampf contributed to this report.